Esteem is a proud member of the API. The American Petroleum Institute (API) is the only American national trade association that represents all aspects of America’s oil and natural gas industry. Its more than 600 corporate members, from the largest major oil company to the smallest of independents, come from all segments of the industry. They are producers, refiners, suppliers, pipeline operators and marine transporters, as well as service and supply companies that support all segments of the industry.In recent years API's work has expanded to include a growing international dimension, and today API is recognized around the world for its broad range of programs. 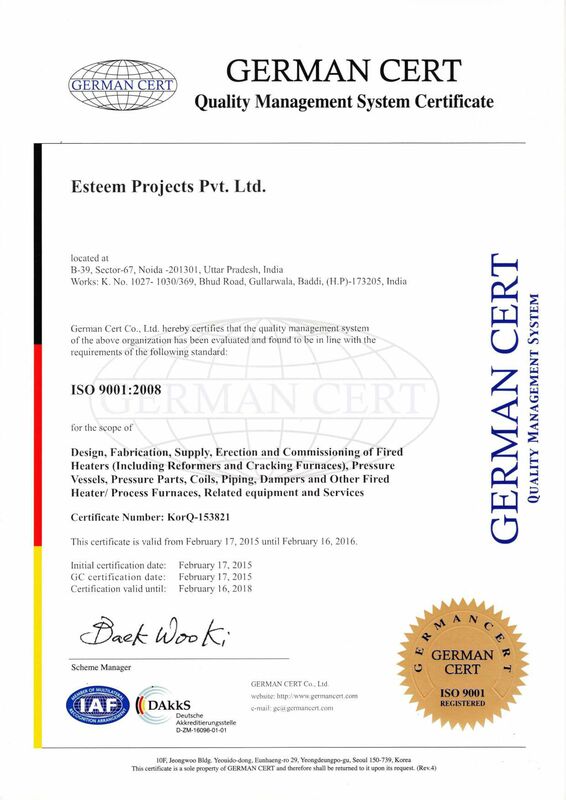 Esteem is enlisted with Engineers India Ltd. as an approved supplier/ contractor for Fired Heaters. Engineers India Ltd (EIL) is one of the leading design and engineering organizations in South Asia. EIL provides the complete range of services required to conceptualize, design, engineer and construct projects to meet the specific needs of its clients. Its association with clients extends beyond the commissioing of their plants through monitoring operation of each plant and accumilating feedback on performance.EIL has to its credit more than 5000 assignments including over 400 major projects. Esteem is proud to be associated with EIL. Esteem has an MOU with CEIL for various inspection related services.CEIL is a leading inspection and audit agency of South Asia. The Company undertakes activities related to Certification, Re-certification, Safety Audit and HSE Management Systems for offshore and onshore Oil & Gas Facilities. CEIL also undertakes Third Party Inspection of equipments and installations in the Hydrocarbon and other quality sensitive sectors of the Industry.We are pleased to be associated with the company having such high professional standards and performance. Esteem is a member of the Noida Entrepreneurs Association.Noida Entrepreneurs Association is one of the pioneer Associations in UP and has been functioning since 1978. It is a unique Association of Noida based industries representing more than 6000 Small and Medium Industries. NEA take up the cause of Industries at all forums very effectively and successfully. The Association has its link with various Associations like PHD , FICCI, CII, and ASSOCHEM etc.Our ClientsPlease click here to see a partial list of our clients.